After her Lady Dior Fall/Winter 2015 Campaign, Marion Cotillard returns for another gorgeous Lady Dior Campaign. The French actress wears a camel coloured trench, and is lensed near the Seine River, by the noted photographer Peter Lindberg. 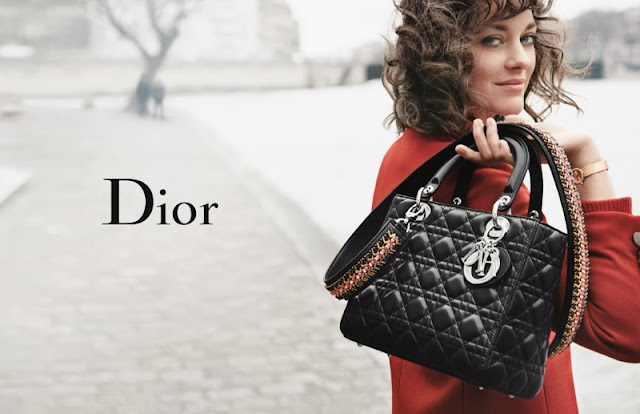 Marion's retro curled hairdo gets caught in the breeze while she holds on to a Lady Dior design with gold trinkets. Another glamorous shot has the star looking elegant, dressed in red with a black quilted Lady Dior handbag with silver charms.